ST. LOUIS, Mo. 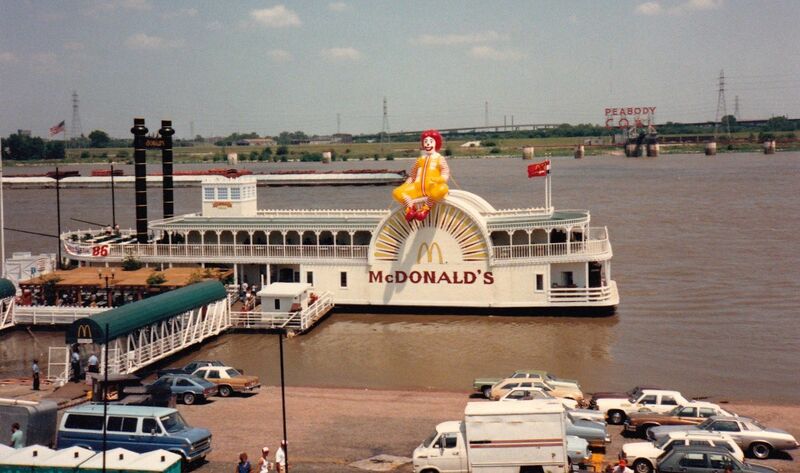 — The world’s first floating McDonald’s opened on the banks of the Mississippi at St. Louis on this date 39-years-ago. It was moored just south of the Gateway Arch for 20 years before closing in the year 2000. The restaurant chain originally wanted to open a location in the museum under the Gateway Arch. The St. Louis Post-Dispatch reports that the government said that they were not interested in making the space available to a private business. McDonald’s real estate manager had the idea of putting the restaurant on a riverboat. They faced some opposition from St. Louis Aldermen. They feared the location would compete with or exploit the nearby national monument. The boat ended up generating $100,000 in tax revenue annually. The McBarge or Friendship 500 was the second floating McDonald’s location in the world. It was built as part of the 1986 World Expo in Vancouver, British Columbia. The original coverage of the event from the St. Louis Post-Dispatch is going viral with thousands of reactions on Facebook.